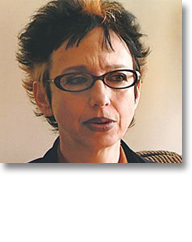 Avital Ronell (born 15 April 1952) is Professor of German, comparative literature, and English at New York University, where she directs the Research in Trauma and Violence project, and has also written as a literary critic, a feminist and philosopher. Ronell was born in Prague to Israeli diplomats and was a performance artist before entering academia. She studied with Jacob Taubes at the Hermeneutic Institute at the Free University of Berlin, received her Ph.D. under the advisement of Stanley Corngold at Princeton University in 1979, and then continued her studies with Jacques Derrida and Hélène Cixous in Paris. She joined the comparative literature faculty at the University of California, Berkeley before moving to NYU. She is also a core faculty member at the European Graduate School. Themes of her work include technology (Test Drive, Telephone Book) and Stupidity/Idiocy. In addition to her own writing, she has produced English translations of Derrida's work. Ronell's major works include The Telephone Book, Crack Wars and The Test Drive. The author's deconstructive approach (wherein close reading of texts unveil hidden power structures) is informed by Derrida, who was a close friend of Ronell's. The Telephone Book focuses on three themes: technology, schizophrenia and electric speech. The book begins with a sustained examination of Heidegger’s involvement with the Nazi Party and proceeds through a history of the telephone in light of Heidegger's "call to being." Ronell demonstrates the complexity of "the call" and its presence throughout contemporary culture including technology, psychology and art. In The Telephone Book, Ronell rejects the authoritarian position of the author and instead refers to herself as the "operator" of the text. Crack Wars likens addiction to literature to drug addiction. Ronell avers that the work is a political gesture against the hysteria of the "racist" war on drugs. Beginning with an extensive survey of philosophical works on intoxication, including writings by Nietzsche, Baudelaire and Benjamin. Crack Wars then examines Heidegger's descriptions of want, wishing and "being towards". The Test Drive investigates the underlying logic of contemporary scientific discourses and their ethical and political implications. It does so by focusing on the idea of "the test" as a basis for discovering knowledge.